I started this research in preparation for a talk that I am giving at the end of October for the NASPHGHAN conference (https://www.naspghan.org). I was asked to prepare a 20 minute presentation on when to order a swallow study. Here are some excerpts from my presentation. 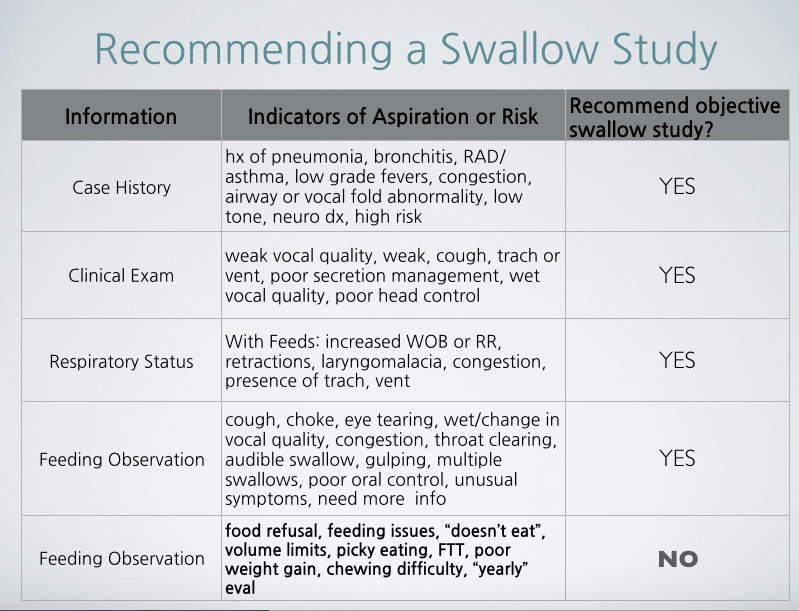 When referring to an objective swallow study, I am referring to a video fluoroscopic swallowing study (VFSS) and/or a fiberoptic endoscopic evaluation of swallowing (FEES) . The limited research we have in peds indicates both assessments are valid instruments to diagnose dysphagia . While there are some obvious pros and cons of each test, I stand by the impression that both are valid and it is good to have two options. I have seen children in clinical practice benefit from one or both of these procedures to establish effective intervention. How good are we at detecting aspiration from a clinical evaluation? As much as I hate to admit this, given the high rates of silent aspiration in the pediatric population, our clinical feeding evaluations are proving to not always be very sensitive to detect aspiration. No, not every child needs a swallow study. I don’t think it means every child needs an objective swallowing evaluation. That would be unethical given what we know of the risks of radiation as well as the invasive nature of the FEES. I believe it means as clinicians we need to understand the factors that put a child at high risk for dysphagia. Factors to consider before recommending a VFSS procedure from Arvedson et al. 2017. The readiness of the child to participate in the examination procedure. Timing of the study is important. Since this presentation is primarily for physicians and nurse practitioners, when to order a test is very important. Order the study if the child is showing obvious signs and symptoms of pharyngeal dysphagia or is at HIGH risk (such as a child with a trach or ventilator) . Many children will participate better during a swallow test if they have some experience or practice eating. I like to see children practicing their skills before the test so we can get a better assessment. Conversely, I don’t like to do swallow studies on children who have never eaten because they have a difficult time participating (again, there is always an exception) or “so that a therapist” can then begin working with the child. And, please don’t do a swallow study for food refusal alone or picky eating unless there is a strong reason too. On our feeding team, we like to manage GI issues before we schedule the swallow study for this reason. Or conversely, if a child comes to us with a history of aspiration and GI issues, we will treat the GI issues and then repeat the swallow study to determine if we can get improved function. As clinicians, we often use language that sounds like a test is black and white, however, an objective swallowing test is a dynamic evaluation providing information on coordination, timing, and safety of swallowing function. While we may use words that say things like “a child failed for thin liquids” that alone diminishes the information we gather about why a child may have aspirated and what we can manipulate from a therapeutic perspective to improve function. Help families understand we are gathering information on the swallowing process. In the articles by Duffy, 2018 and Arvedson, et al, 2017, the authors state the goals of instrumental assessment are to assess oropharyngeal function, determine swallowing safety, assess the effectiveness of intervention strategies, establish a safe diet, and develop a functional and safe feeding plan. Intended to define oropharyngeal physiology in terms of timing, strength, and sensory awareness. The majority of children will tolerate a VFSS better than a FEES and have easier access to this test. Therefore, it is often the test performed first or requested. 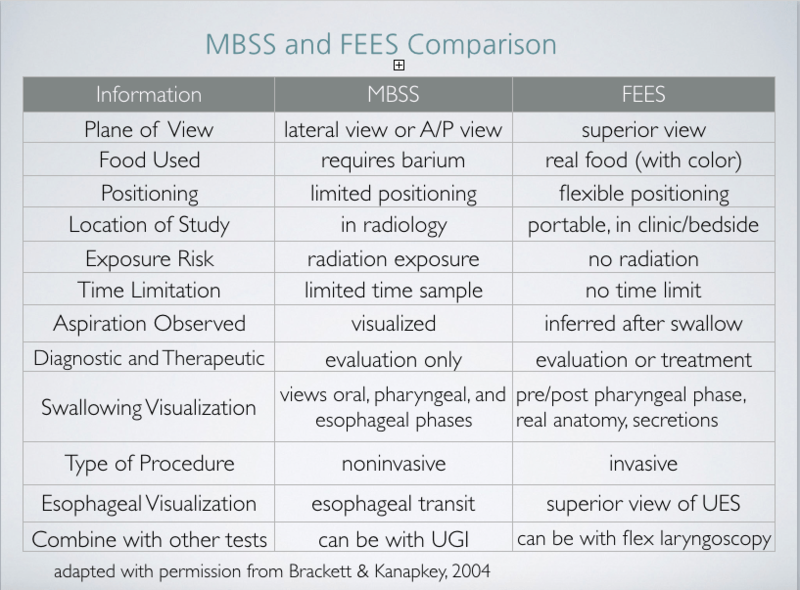 However, due to ability to view real anatomy including the larynx, alter positioning, assess secretion management, the FEES may be the better choice for some patients. Many children tolerate and do well with the FEES so don’t immediately discount this based on the fact that it is an invasive test. Choose the best test for the patient. If unsure whether to order a study or not, I recommend primary care providers refer the child to a therapist for a clinical feeding evaluation first so that an experienced therapist can help guide the decision if a child needs a test and if they are ready for a test. If a clinician is unsure, refer the child to a therapist who performs objective swallow studies to help make the decision. Remember, it is only a brief moment in the child’s swallowing history. The study is part of many pieces of information that is used to make a plan for feeding and intervention. Arvedson JC: Assessment of pediatric dysphagia and feeding disorders: clinical and instrumental approaches. Dev Disabil Res Rev 2008;14:118–127. Arvedson, J. & Lefton-Greif, M. 2017. Instrumental Assessment of Pediatric Dysphagia . SEMINARS IN SPEECH AND LANGUAGE/VOLUME 38, NUMBER 2 2017 . Beer S, Hartlieb T, Müller A, Granel M, Staudt M: Aspiration in children and adolescents with neurogenic dysphagia: comparison of clinical judgment and fiberoptic endoscopic evaluation of swallowing. Neuro- pediatrics 2014;45:402–405. Brady S, Donzelli J: The modified barium swallow and the functional endoscopic evaluation of swallowing. Otolaryngol Clin North Am 2013;46:1009–1022. Calvo, I., Conway, A., Henriques, F., Walshe, M. Diagnostic accuracy of the clinical feeding evaluation in detecting aspiration in children: a systematic review. Dev Med Child Neurol. 2016 Jun;58(6):541-53. 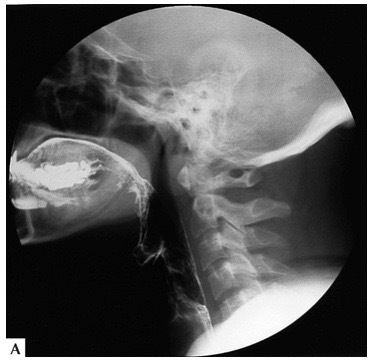 DeMatteo C, Matovich D, Hjartarson A: Comparison of clinical and videofluoroscopic evaluation of children with feeding and swallowing difficulties. Dev Med Child Neurol 2005;47:149–157. Duffy, K. 2018. Dysphagia in Children. Curr Probl Pediatr Adolesc Health Care. 2018 Mar;48(3):71-73. Duncan DR, Mitchell PD, Larson K, Rosen RL. Presenting Signs and Symptoms do not Predict Aspiration Risk in Children. J Pediatr. 2018 Jun 27. pii: S0022-3476(18)30743-1. Manno, C. (2012). Clinical and Instrumental Evaluations of Feeding and Swallowing In VanDahm, K. (Ed. ), Pediatric Feeding Disorders: Evaluation and Treatment (pp.189-214). Framingham, MA, Therapro. Excellent post! So well done. I am looking forward to your talk at NASPGHAN. This information is very helpful to medical providers. I have had the benefit of working with excellent ST’s (yourself included) and OT’s to help make the decision on when to obtain testing. Your summary is great! I agree with management of GERD before testing if possible and I also don’t believe every child needs a swallow study.